So I got this journal at Borders a while ago and I just had to get it because it seemed perfect for me. In case you can't see in the picture, it has my name on it. 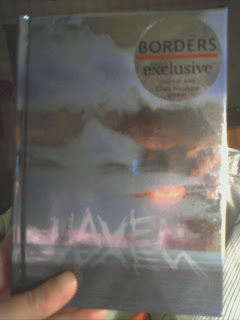 It also has a poem by Ellen Hopkins inside called "Haven" (I would recommend looking it up cause its really nice). My question is, what should I put in it? As Andelle and I know, we have short attention spans when it comes to diaries. We have a collection of books we might have written on five or less pages that we don't return to. This journal seems too nice to just forget. Should I write in it like a diary? 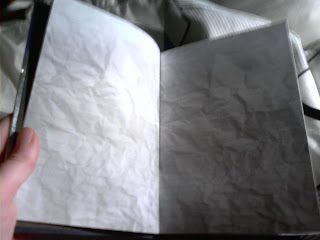 Should I write my poems in it? Should I write a story that takes up its pages? Ideas are appreciated. WHAT BOOK ARE YOU READING? The Queen's Fool by Philippa Gregory. I'm hoping I'll be able to use it for an independent reading project. WHAT'S ON YOUR MOUSE PAD? Well it's not mine, but it's black. HOW MANY RINGS BEFORE YOU ANSWER THE PHONE? It depends on if someone else is in the house. WHAT IS MOST IMPORTANT IN YOUR LIFE? Humor in everything. GLASS HALF EMPTY OR HALF FULL? Depends on how it looks. If it looks slightly more than half, then it's half full. If it looks slightly less than half, then it's half empty. FAVOURITE MOVIE? Zoolander! "I can't help that I look really really ridiculously good looking"
IF YOU COULD BUILD A HOUSE ANYWHERE WHERE WOULD IT BE? Somewhere in Maine on the coast. WHAT'S YOUR FAVOURITE ARTICLE OF CLOTHING? Bell-bottoms. TECHNOLOGY OR ART? Technology. I had to choose 6 electives for next year. Half of them were tech credits, and only one was a fine art credit. FAVOURITE TIME OF DAY? When it's the weekend, and you're up late, past your parent's bedtime, and you just chill with your friends online. WHAT TIME DO YOU WAKE UP IN THE MORNING? 6 am on weekdays, and between 9am-3pm on weekends. WHAT'S YOUR FAVOURITE KITCHEN ITEM? The boombox that chills out there. WHAT MAKES YOU REALLY ANGRY? Close-minded people. And liars. And posers. And teenagers. IF YOU COULD HAVE ONE SUPER POWER, WHAT WOULD IT BE? To read minds. Gawd, that would be awesome. CAN YOU JUGGLE? No. I tried to get dad to teach me once, but the only thing he told me was "If you can drop stuff, you can juggle"
WHAT IS YOUR FAVOURITE DAY? Fridays. IF YOU COULD TAKE A VACATION ANYWHERE IN THE WORLD WHERE WOULD IT BE? I would go to Canada or England with ma cousines et ma sœur. What's a better way to beat the winter downs than with brownies! Me and mom were making brownies in my totally awesome brownie pan, when something smelled like it was burning. We were preheating the oven at the time, and when mom opened the oven door, she immediately yells for dad, and dad comes. Apparently dad forgot to clean up the potato that exploded in there two nights ago, and they looked about ready to burst in to flames. Regardless, I'm still looking forward to some delicious chocolaty goodness.